Get 12 full months of UNLIMITED downloads from our entire Products section (we have well over 2000! digital downloads to choose from) - for ONLY $69.95 USD (auto-renews for life at this price OR $99.95 purchase option which does not renew for your convenience). 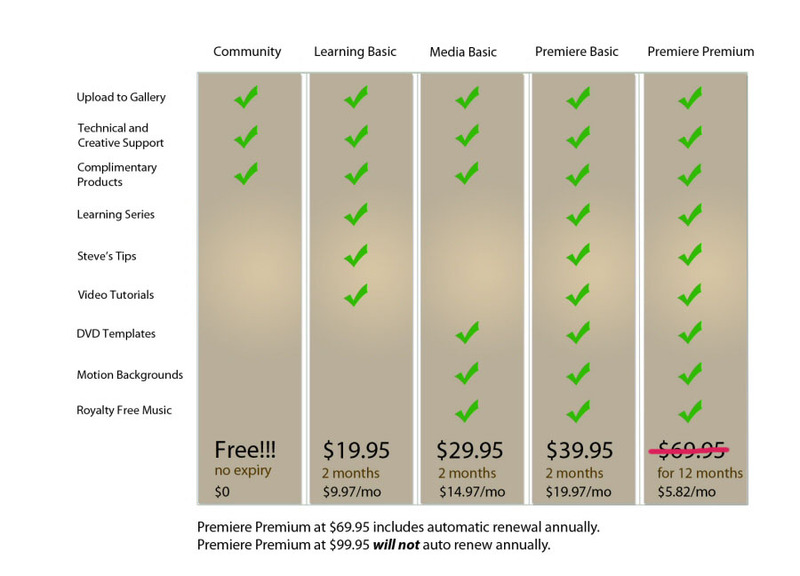 Other subscription options as low as $19.95 USD! We have different subscription plans to fit every budget as well as your immediate media requirement. You could be downloading within a matter of minutes. We created this site several years ago to assist the creative video hobbyist who considers video much more than just a hobby. To us, muvipix videography is about shooting home movies that don't look like home movies. It's about shooting works-for-hire that don't merely capture the events on tape or memory widget but tell stories, touch and inspire. It's about doing things with a handheld camcorder and a personal computer that are every bit as exciting as the things professionals do with multi-million dollar equipment. It's about making whatever we shoot look as exciting and as polished as any Hollywood production. We are here to help make your particular projects the best they can be! Whether it's a quick question you have about a video editor or video related media that you may need to further polish your masterpiece; we may have what you need. What's in the name, "muvipix"? Our name is meant to imply the media and support you'll find here: music, video, pictures. This is a site created by, supported and populated by people who love making videos and love making them well. Down the streets of our little city you'll find DVD menu templates, royalty-free music and motion backgrounds as well as technical support and like-minded friends. You'll also find tutorials, tips and step-by-step instructions that, whether you're a novice or a long-time video editor, will show you how to take your videomaking to the next level. When registering at our Forum (totally free), 100% of ad-free space in which to display your works. No popups, no catches. Just a place to show off your stuff and ask questions. If you need something to help with your project, we have plenty to choose from (some are FREE). And for our muvipix Premiere subscribers it's ALL FREE for the taking. If this sounds like a place you'd like to call home, we invite you to join our little community. You won't find a more supportive group anywhere on the Internet! And, for those not yet ready to commit, we invite you to explore our town and sample our wares. We think, once you've come to know the place, you too will want to make it your home... or at least a place to come visit once in a while. Happy editing!